Data and analysis on broadband offerings in 24 cities across the world. The Cost of Connectivity is an annual report that examines the cost and speed of broadband Internet access in 24 cities in the United States (U.S.) and abroad. Overall, the data that we have collected in the past three years demonstrates that the majority of U.S. cities surveyed lag behind their international peers, paying more money for slower Internet access. The report presents the 2014 Cost of Connectivity data, which was collected between July and September 2014. A literature review of other studies that rank and compare broadband speeds, pricing, and market factors domestically and internationally, which explains how the Cost of Connectivity fits among other reports produced by international organizations and independent think tanks and contributes new data and analysis. A detailed methodology, which explains both the data collection process and the methods used to conduct the analysis for our findings. The data from this and past reports is also publicly available online for researchers and other interested parties to view and download. The prevalence of data caps and modem fees. Key takeaways from this analysis and further research questions based on our data and observations. Data Access via our open data portal, including the ability to explore and filter the data, download the data, or access the data via an API. For the third year in a row, the Open Technology Institute at New America conducted an extensive research project aimed at assessing the cost and quality of broadband Internet access plans in 24 cities in the United States and abroad. Our findings remain consistent — the majority of U.S. cities included in our report lag behind their international peers. This year, we streamlined our data collection to focus on Internet-only home broadband offerings1 and mobile USB dongle and wireless hotspot plans. As in previous years, we did not collect or analyze data on mobile phone data plans. The report contains several components. First, it presents a review of existing literature on the subject of broadband availability and the relative competitiveness of broadband offerings and broadband packages available in the U.S. and around the world. In this section we attempt to highlight the strengths and weaknesses of existing reports and to situate the Cost of Connectivity research among them. Next, the report contains a fully updated methodology that explains the research methods used to collect and analyze data as well as the methods used to present the findings. We then present our findings in three distinct subsections: Home Broadband, Mobile Broadband, and Additional Findings. In each of the first two subsections, the analysis begins with a straightforward presentation of plan rankings, and then moves through more detailed presentations that explore the relationships between price and speed. The Additional Findings subsection includes analysis of other data collected in the research, including some year-to-year price and speed trends, the role of municipal networks, the impact of data caps and modem fees, and examples of particularly user-friendly Internet service provider (ISP) websites. The report concludes with key takeaways and suggests questions for further research. Virtually every city in the home broadband “Speed Leaders” ranking has seen an annual increase in its top speed offering since 2012. However, those speed increases have not resulted in dramatic shifts in the ranking of U.S. offerings compared to those in other countries. Most Asian and European cities provide broadband service in the 25 to 50 megabits per second (Mbps) speed range at a better value on average than North American cities (with a few key exceptions). In addition, when it comes to the estimated speeds a customer could expect to get for $50 in each of the cities we surveyed, the U.S. is middling at best, with many cities falling to the bottom of the pack. Our analysis also finds that, in terms of speed and price, cities with municipal networks are on par with Hong Kong, Seoul, Tokyo, and Zürich and are ahead of the major incumbent ISPs in the U.S. In the mobile broadband space, USB dongle and wireless hotspot device offerings continue to be expensive substitutes for home broadband connectivity, with consumers in some other countries paying the same price for mobile plans with data caps that are up to as 40 times higher than those offered by U.S. providers. While the findings of this year’s Cost of Connectivity are similar to those of previous years, this iteration employs new analytical methods to offer more robust analysis and explain emerging trends. As in previous years, our data are publicly available and downloadable, and in an effort to easily enable comparisons over time, we have published all three years’ data sets in one place on our website. Finally, this year’s report is available in both print and interactive web formats, so that researchers and advocates can engage directly with the charts and underlying data. A number of studies and reports are regularly published on broadband speeds, affordability, and the nature of the broadband market in the United States and around the world. These reports provide businesses and consumers with information about how their Internet connections perform and what they cost, as well as raw data on speeds and prices. Four leading reports in this area Akamai’s State of the Internet, the International Telecommunication Union’s (ITU) The State of Broadband reports, the Organisation for Economic Co-operation and Development’s (OECD) broadband portal, and the Federal Communication Commission’s (FCC) Measuring Broadband America. In addition to these regular reports, independent authors and research institutions have published a number of studies about broadband speeds and prices in the U.S. and abroad. This section provides an overview of the major studies and explains how the Cost of Connectivity research is distinct. Akamai’s State of the Internet report2 covers a variety of subjects, including Internet security, IPv4 and IPv63 penetration, actual broadband speeds, and mobile connectivity. Akamai collects its data through its “globally-deployed Intelligent Platform”4 and defines broadband Internet as 4 megabits per second (Mbps) or greater and “high broadband” as 10 Mbps or greater. The report finds that global speed averages increased over the previous quarter for 98 out of 137 countries. Akamai’s raw data are useful for understanding actual speeds around the globe, but the data are collected using Akamai’s proprietary network, meaning the data are not as easily accessible as other broadband measurement platforms.5 While the Akamai report focuses on actual broadband speeds, the Cost of Connectivity provides complementary information on advertised speed and price. The ITU’s The State of Broadband is published annually and focuses on Internet access across the world.6 Research is conducted by the Broadband Commission for Digital Development, a group created in 2010 “in response to UN Secretary-General Ban Ki-moon’s call to step up efforts to meet the Millennium Development Goals.”7 The goal of the report is to spread awareness of the benefits of broadband access and provide guidance for policymakers who wish to expand access in areas of the world that need it most.8 The “Defining Broadband” section details recent and upcoming innovations in broadband technology.9 The report formally defines broadband as 256 kilobits per second (or 0.256 Mbps), a speed that is more akin to dial-up than to what much of the world considers high-speed connectivity.10 This broad definition may be useful for global comparisons between developed and developing countries, but the data in the report shed little light on the specific contours of the high-speed Internet market in the U.S. in comparison to countries in Europe and Asia. The OECD’s broadband portal hosts decades worth of data on broadband Internet. The OECD has collected data on broadband penetration, usage, coverage, prices, and speeds for more than ten years and publishes raw data on these topics yearly.11 The latest available data set for many of these categories is from December 2013 (published in July of 2014) and compares advertised speeds and prices in the 34 OECD member countries.12 It generally places the U.S. in the middle or towards the bottom of the pack in terms of price per megabit. Although the U.S. is significantly larger geographically than many of the other OECD countries and has been improving its broadband offerings each year, the data in this report show that especially for high-speed tiers, broadband Internet service in the U.S. is still very expensive compared to other OECD countries. Despite the breadth of data available through the portal, the OECD report has some limitations. First, rather than provide a comprehensive overview of all available providers, the report surveys only three broadband providers in each country.13 For countries as large and diverse as the U.S., this limited sample inevitably leaves out a number of Internet service providers (ISPs). Second, the report defines broadband services in a broad manner, and like the ITU report, it counts speeds that are as low as 0.25 Mbps as broadband, though it does include speeds up to 45 Mbps as well. Many of the entry-level packages included in the report do not meet the current definition of broadband, let alone the “high-speed” threshold of 25 Mbps that has been proposed in various contexts around the globe.14 Third, the exclusive presentation of broadband prices in terms of “price per megabit” does not reflect the way pricing information is portrayed to consumers (i.e. 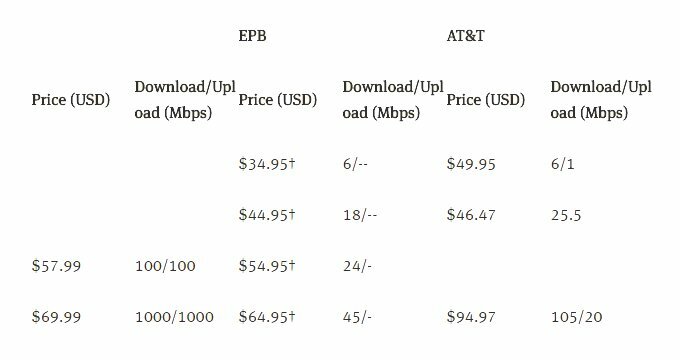 customers purchase broadband service according to speed tiers determined by the provider, rather than selecting a “rate” for the price of each megabit). Finally, the OECD collects information on enterprise plans, many of which are priced significantly higher than traditional residential services and can skew the data when combined in the same buckets as residential service. The FCC regularly collects and publishes raw data on broadband speeds. Each year since 2011, the FCC has released a report from the Measuring Broadband America program, which provides data on speeds delivered to consumers from major ISPs in the U.S.15 The data collected for these reports rely on a hardware/software package provided by SamKnows16 to thousands of subscribers who have volunteered to be a part of the study. The report includes one month of data from 14 ISPs across the U.S. who offer DSL, cable, fiber, and satellite services. The opt-in nature of the data collection means that the report relies on a convenience sample, which introduces inherent biases. The report also notes other limitations, such as the fact that it largely measures service tiers that are popular among subscribers rather than the full gamut of offerings from each provider. The report focuses primarily on network performance during peak usage times rather than at times when network congestion may be at a low point and aggregates the data collected for national comparisons rather than local or regional comparisons. Like the aforementioned reports, the Measuring Broadband America report is a good complementary resource to the Cost of Connectivity. The Progressive Policy Institute (PPI) published a report this year titled The State of U.S. Broadband: Is it competitive? Are we falling behind?29 The report takes issue with the idea that the quality, price, and deployment of broadband in the U.S. are worse than that of the rest of the world, as well as the argument that competition in the U.S. broadband market is not robust.30 The report notes that the U.S. ranks tenth in average broadband speed according to Akamai, but points out that many factors beyond speed affect a country’s broadband competitiveness. In a section on competition and the broadband market, the report asserts that the market alone will encourage the Internet to evolve in a natural and generally beneficial manner, and does not require regulation in the form of network neutrality or caps in spectrum auctions.31 With regard to broadband pricing, the study takes data from the ITU’s Measuring the Information Society report, which offers a combined index for mobile telephony, fixed telephony, and fixed broadband services, that can be used to make international comparisons of price as a share of gross national income per capita (GNI). The PPI report uses these data to make inferences about the approximate pricing for various services, ultimately showing that the U.S. is far ahead of its G-7 counterparts and is pulling ahead faster year by year.32 It is important to note, however, that GNI per capita in the U.S. is significantly larger than the next country’s GNI per capita, thus ultimately reflecting lower prices as a share of GNI per capita. Furthermore, the standard price used in this comparison is for low-speed broadband,33 not high-speed Internet connections. Clearly, there are many ways to measure and compare broadband speeds and prices as well as the state of the broadband market. The Cost of Connectivity, now in its third year, is designed to be a consumer-focused report that conveys the costs and speeds available in 24 cities around the world in terms that are familiar to individual users.34 Our data are based on original research collected from the websites of individual providers every year and include a range of additional metrics including data caps, modem and activation fees, and other relevant information about the actual packages available in these cities. The analysis in the 2014 report includes comparisons of specific options available in each city as well as data on averages and the relationship between speed and price for home broadband packages around the world. As such, this report helps individuals, researchers, and policymakers get a clearer picture of the broadband landscape in these cities. The Cost of Connectivity is an annual residential broadband survey conducted by the Open Technology Institute to help show what consumers in 24 cities around the world pay for high-speed Internet connections. Data collection for the report took place between July and September of 2014. In this section, we explain the metrics collected, the criteria used in city selection, and the methodology used for our rankings and analysis. The report is a best effort compilation of pricing data in the selected cities. We identified the main broadband providers offering home broadband and mobile data services and documented the publicly available information about their plans. The pricing data presented in the report reflect the non-promotional price that a new customer would pay, except in circumstances where non-promotional pricing was unavailable. Given that many providers’ websites are not presented in English, researchers tried to ensure that accurate foreign language data was collected. In addition to English fluency, members of the data collection team had limited proficiency in Czech, French, German, Latvian, Romanian, Russian,35 and Spanish. We used Google Translate for all other languages. 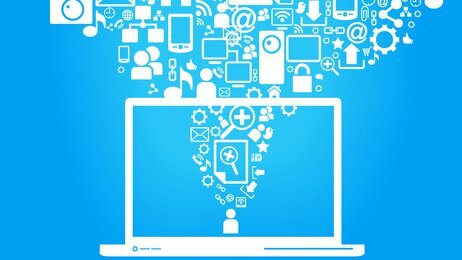 In some cases, information about a specific plan or a provider’s general terms of service is not complete because the information was not readily available on a service provider’s website, or the data collection team’s limited proficiency in the operative language restricted its ability to collect such information. Some provider websites require local addresses to display available plans. In these instances, local addresses were used to confirm availability and price. However, the data collected using this method do not necessarily represent the data for the city as a whole. As high-speed plans may not be available in all locations, and certain broadband providers only offer service in specific neighborhoods, different parts of cities may display different plan options and even different prices. The prices we present reflect researchers’ best efforts to collect valid information for each city surveyed. In the past, the report has included data on all broadband bundles, including “Triple Play” bundles of television, phone, and Internet services. This year, however, we focus primarily on broadband-only options. Television packages are generally varied in terms of the number and type of channels offered, and the prices for bundles that include television packages fluctuate accordingly. Likewise, phone packages are variably priced to accommodate ancillary benefits like free international calling. The differences in pricing characteristics for television and phone make it difficult to easily compare one package to another. We collected other bundles (broadband and telephone, broadband and television, and bundles of broadband, telephone and television services) only when no broadband-only option was available. Plans offering exclusively broadband are labeled “Broadband only” in our data set. When providers do not offer standalone broadband services, requiring that customers also subscribe to telephone and/or television services, plans are recorded as either “Broadband + Phone,” “Broadband + TV,” or “Broadband + Phone + TV” to reflect the additional services. 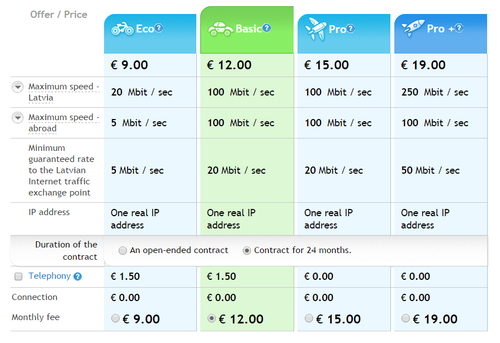 We chose the cheapest bundled package for each broadband speed tier if a provider did not offer a standalone package. For mobile broadband plans, the report focuses on data-only mobile plans that use a USB dongle or mobile WiFi hotspot for connectivity. The report does not include mobile data services that are part of a combined voice and data subscription plan for service on a smartphone. The pricing scheme in these data-only plans is much more straightforward than smartphone plans, which usually include voice and text messaging allotments in addition to data service as well as the cost of the smartphone, each of which affect the one-time and recurring costs to the consumer. All foreign currencies have been adjusted to U.S. dollars using the World Bank’s purchasing power parity (PPP) metric.39 Unlike direct exchange rates, which are often volatile and do not account for global income disparities, PPP conversion rates adjust for differences in the cost of living, price levels, and other factors that affect a consumer’s purchasing power. This allows us to make more effective comparisons between the cities featured in the report. In 2010, the Federal Communications Commission defined broadband Internet service as that which has a minimum speed of 4 Mbps download and 1 Mbps upload.40 Although the FCC is considering raising the minimum definition in a formal proceeding41 — and a recent speech42 by FCC Chairman Tom Wheeler suggested that a new, faster definition of broadband may be imminent — the report relies on the FCC’s previously established download metric as a threshold for data collection. We do not record any home or mobile broadband plans with download speeds advertised as slower than 4 Mbps. The report records network technology if the service provider advertises the technology used. For home broadband services, technology includes variations of DSL, cable, fixed wireless, and fiber optic. For mobile broadband providers, the report reflects the terminology displayed on websites, although we acknowledge that similar marketing terminology, like the term 4G, can sometimes refer to differing network technologies that use LTE, HSPA+, or others. All broadband speeds are based on advertised speeds and listed in megabits per second. It is important to note that advertised speed does not always reflect the speed the customer receives. Price data reflects a best effort collection of non-promotional subscription prices. In instances where a multi-year contract includes an increase in price from one year to the next, the price listed reflects an average of the yearly subscription costs for the contract. The data reflect the price as advertised, which in some cases include taxes. References to data caps are recorded in gigabytes (GB). Where the penalty for exceeding a data cap is an overage fee, we note the monetary amount and the data increment in which it occurs, for example, $10 per GB (notated “$10/GB”). Where the penalty for exceeding a data cap is that a subscriber experiences slowed speeds for a period of time (usually until the end of the billing cycle), researchers note this as “Throttle.” If the speed at which the throttling occurs is disclosed, we record the slower throttled speed in the “Notes” field. Activation and installation fees are any fees associated with the price a new customer must pay to begin service. These may be listed on provider websites as “set-up” fees, “creation” fees, or other variations of these terms. Any fees or costs associated with the rental of a modem or other equipment needed for service is recorded. If providers allow the option to either rent the equipment for a monthly fee or to purchase it for a one-time price, both options and prices are recorded in the entry. This does not mean that the consumer pays both fees. Contract lengths are recorded in months. In instances where changes in the contract length impacts the monthly subscription costs, we recorded the different-length plans as separate entries. Month-to-month plans (often referred to as “no contract” plans) are indicated by a “1” in this column, signifying one month’s commitment. Throughout the report, “N/A” (not applicable) is used to indicate when researchers confirmed that certain data fields did not apply to a service plan. For example, an “N/A” in the data cap field means a plan does not have a data limit. The “N/A” notation is distinct from the period (“.”), which indicates that no information for a data field could be found. In certain cases, a “0” (zero) is used to indicate a value of zero. This applies primarily to modem pricing. For example, when a company does not provide a modem for purchase or rental, but does require the use of a modem, the price of the equipment is passed on to the customer. This is denoted using “N/A”. However, if the company provides the customer with a modem free of charge, the case is denoted using a “0” to indicate that the customer receives a modem at no extra cost. Additional details or information about a specific plan can be found in the “notes” column of the data set. Since 2012, the report has collected data on the same 22 cities to enable year-by-year comparisons and analysis of trends. In 2013, we added Kansas City, KS, and Kansas City, MO, bringing the total number of cities examined to 24. Initial city selection relied partially on cities that ranked similarly according to data provided by the 4th Quarter, 2011 Akamai State of the Internet report.43 The major cities in the report were selected from nations ranking similarly to the U.S. in terms of broadband speeds, population sizes, and population densities. In the U.S., the report examines four major cities: Los Angeles, CA, New York, NY, San Francisco, CA, and Washington, DC. International cities with similar population profiles were selected for comparison. In addition to major U.S. metropolitan areas, the report examines pricing data for a series of smaller and less dense cities that have municipal broadband networks. While Hong Kong, Paris, and Seoul are outliers in terms of population density, a best effort attempt was made to include European counterparts for the major U.S. cities included in the research, bearing in mind that the smaller U.S. cities are less dense than their international counterparts. As noted in previous reports, population density is an important variable that helps dictate broadband speeds and prices. See the Appendix for more information on the population size, density, and other metrics of the selected cities. In the findings section, we include tables and charts that compare the packages available in various cities based on speed, price, and the cost of certain amounts of mobile data. Some of these figures (e.g. “Wired Speed Leaders,” “Best Deals Under $40,” and “The Cost for 3 GB of Mobile Data”) are based on comparisons of the actual prices and speeds advertised for specific packages in each of these cities. Additionally, we offer more a robust cross-city analysis by creating a standard metric to compare speed and price. We describe the methodology for our rankings and statistical analysis in detail below. 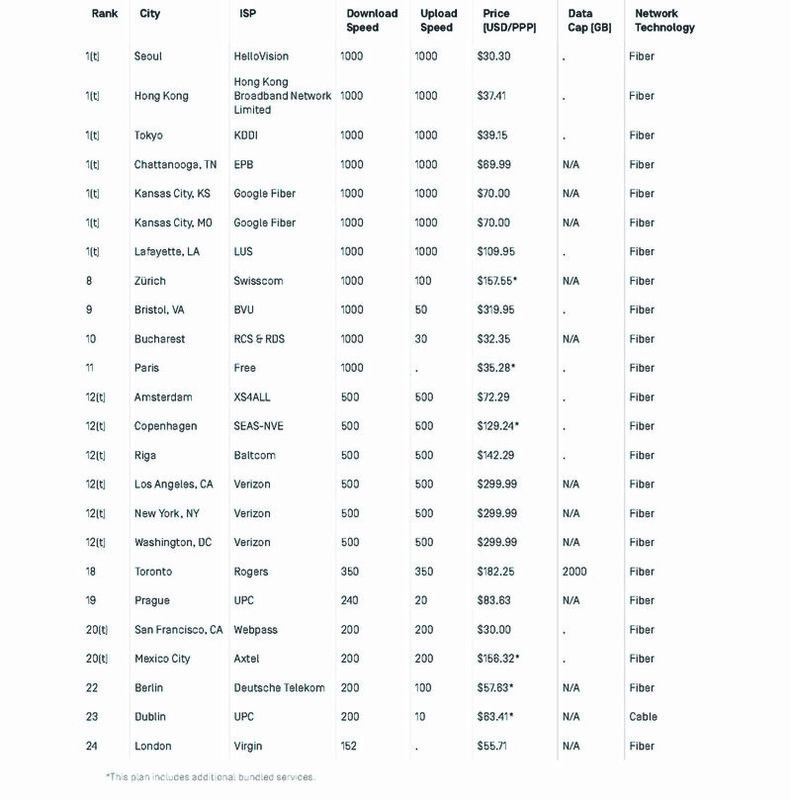 In Figure 1, we compare “speed leaders” and rank offerings in each city based on the fastest advertised Internet speeds found in our research. The offerings are ranked by download speeds, with higher upload speeds used to differentiate between plans that are tied. Figures 2 and 9 rank home broadband packages based on speed and mobile broadband packages based on the highest amount of data a customer can buy for under $40. Figure 2 presents the fastest home broadband plan a customer can purchase for $40 or less. Figure 9 ranks mobile broadband plans with the largest data cap offered for $40 or less. In our ranking, we included any contract length. Additionally, while the advertised speeds listed here are theoretically attainable, mobile broadband providers often list the maximum speed attainable by the device associated with the plan, rather than a speed promised to the consumer. Since mobile broadband speeds vary greatly depending on factors like network technology, geography, congestion, and dongle models — and because most carriers offer plans based on data usage rather than speed — the plans are ranked in descending order based on the size of the data cap. Figure 3 provides a comparison between the nine U.S. and ten European cities contained in our sample. In order to create this comparison, we selected a number of speed tiers at which consumers can typically purchase broadband service. We filtered our data set to display only the plans available in each of the sampled cities at the given tier, found the minimum, maximum, and median price in each tier for each continent, and plotted the results for each speed tier appropriately. Figures 4 and 11 depict the average price a customer pays for a given range of speeds for home broadband and data caps for mobile broadband plans. Figure 4 shows the mean price of home broadband plans offering between 25 and 50 Mbps download speeds for each of the cities surveyed. Figure 11 shows the mean price of all mobile broadband plans with data caps between 2 and 5 GB for each city. Much like the average price figures, the average speed figures calculate the average speed of plans in a given price range. Figure 5 portrays the mean speed of all home broadband plans priced between $35 and $50 in each city surveyed. Figure 6 depicts the mean speed of all home broadband plans priced $50 and above in each city surveyed. Figures 7 and 8 allow us to further examine the relationship between speeds and prices. To create a standardized metric, we conducted a statistical analysis using a best-fit trend line to estimate the relationship between pricing and speed for each city’s home broadband plans. This enables us to compare the estimated speed at a given price, or the estimated price at a given speed in a particular city’s market. The estimates do not reflect any actual plans, but rather provide an estimated price or speed based on the trends set by data collected on existing plans. In order to create these numbers, we created two scatter plots for each city: one depicting the relationship between speed and price, and the other depicting the inverse relationship. The relationship between speed and price is not linear for every city, and some trend lines were constructed to reflect this reality. 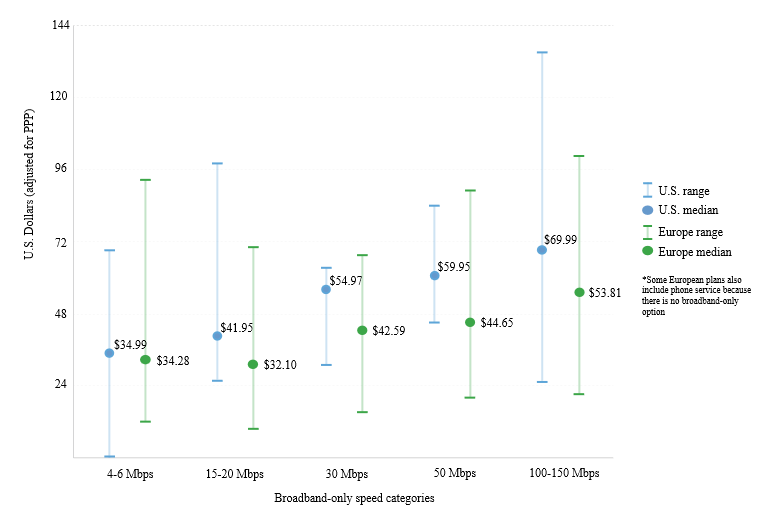 This means that the best-fit line equation for the relationship between speed and price for a city is either linear, the natural log, or exponential. The equation for the line depicting the relationship between price and speed is the inverse. After producing these equations we were then able to estimate a speed at a given price point (Figure 7) or a price for an expected speed (Figure 8). In Figure 10, we present the lowest priced plans a customer can pay for at least 3 GB of mobile data in each city. If the cheapest package that allows customers to receive at least 3 GB has a higher cap, that plan is used as the city’s representative in the ranking. In some cases this means that some plans will have better values in terms of price per GB of data than others. Figure 12 depicts the mean data cap of plans priced between $35 and $45. Copenhagen is an outlier offering an average data cap of 125 GB in this price range. We have therefore excluded Copenhagen from this chart to allow for easier comparison of the other plans. In this section, we analyze the data in a number of different ways to illuminate various trends and data points. For both home and mobile broadband, we conduct straightforward comparisons of the best options available to consumers in each city depending on whether they are looking for high-speed, a certain amount of data, or the best deal for a given price. Next, we break the data up into various speed, data, and price buckets and compare averages of all plans available in each city. Finally, we conduct a statistical analysis on all home broadband packages in order to create a standardized metric to determine the relationship between price and speed in each city and present the comparison at a specific price and speed. In the additional findings section, we present anecdotal analysis to demonstrate examples of speed increases and price drops, explore the value of municipal networks, examine the prevalence of modem fees and data caps, and present good models for plan presentation and flexibility. This section focuses on the findings from our data on wireline home broadband plans. We find that U.S. cities that perform above average tend to be those with municipally owned broadband networks or innovative service providers. We also present the speed customers get for $50 and the price they pay for 25 Mbps in each city. These analyses reaffirm that customers in the U.S. are generally paying more for their home broadband speeds. What Can You Do With Speed? Note: All data in this table are from “Verizon FiOS Speeds,” Verizon, (accessed October 22, 2014) available at http://fios.verizon.com/fios-speeds.html. 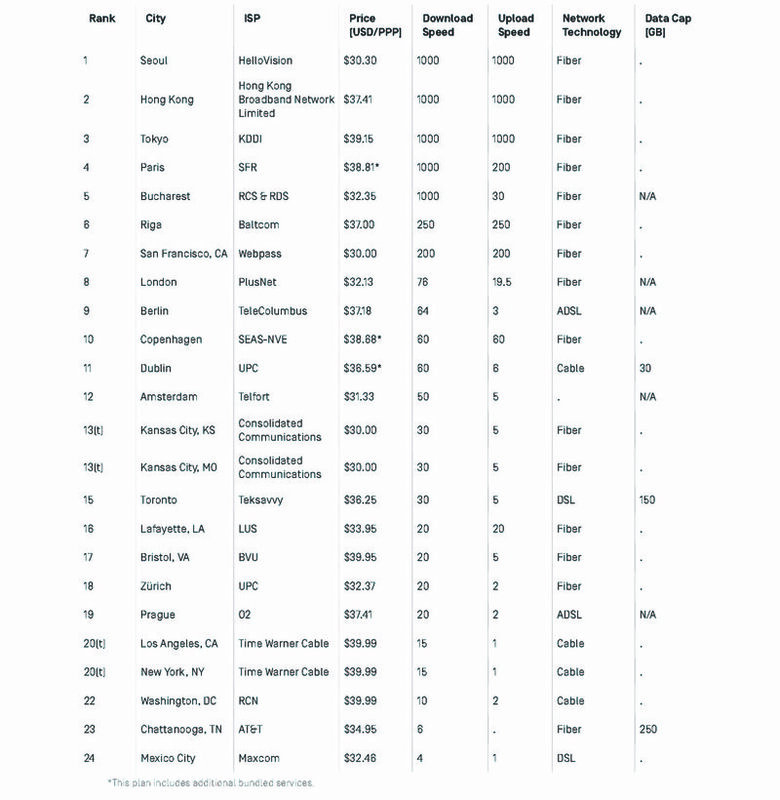 Virtually every city in this ranking has seen an annual increase in its top speed offering since 2012. 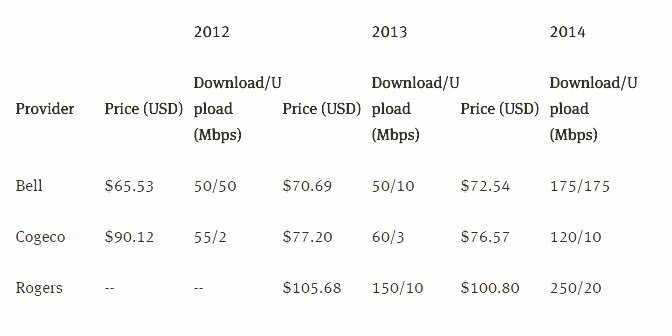 In cases where ISPs offer the same speed as last year, those ISPs have tended to lower their prices. For instance, Lafayette, LA charged $999.95 per month for its gigabit service in 2013 and dropped that price to $109.95 per month in 2014. In Mexico City, a 200 Mbps package was available for nearly $100 less than the price offered for that speed by a different provider in 2013. The average download speed of plans in this ranking increased from 233 Mbps in 2012 to around 500 in 2013, and almost 650 Mbps in 2014. Nearly half of all cities in this ranking offer gigabit speeds, and more than two-thirds of all cities offer service over 500 Mbps. Figure 2 offers a comparison of the fastest home broadband plan from each city priced below $40. We select the best deal from each city and then rank them against each other by speed. 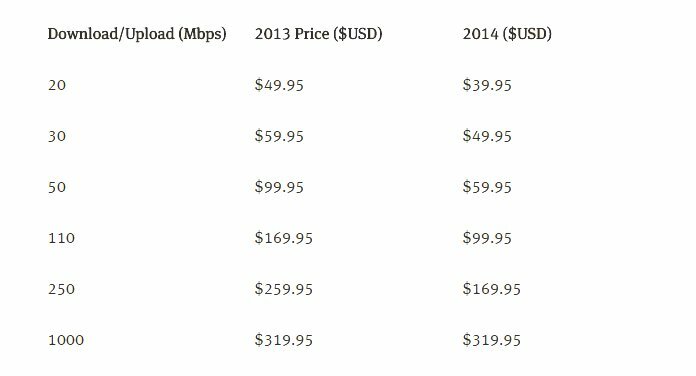 In 2014, five providers offered gigabit service for under $40, up from just one in 2013 and none in 2012. The U.S. cities on this list that are ranked at the middle or higher (Kansas City, KS; Kansas City, MO; and San Francisco, CA) are represented by local, innovative providers who offer competitive alternatives to the services provided by incumbents. Figure 4 shows the average price of home broadband plans in the 25 to 50 Mbps speed range. Most of the Asian and European cities provide broadband service in this range at a better value on average than North American cities. However, Kansas City, KS; Kansas City, MO; San Francisco, CA; and Bristol, VA each rank better than some European cities. Figure 5 displays the average download speed of home broadband plans in the $35 to $50 price range. Like Figure 2, which displays the best home broadband plans available for under $40 a month, this chart demonstrates that the Asian and European cities in our data set perform significantly better compared to the North American cities (including Mexico City and Toronto). In particular, the top three cities each offer an average speed that is nearly ten times faster than the majority of the U.S. cities surveyed. Figure 6 displays the average download speed of all home broadband plans available in each city priced at $50 and above. This chart shows that American cities with retail municipal broadband providers and cities with competitive providers (i.e. Google Fiber in Kansas City, KS and Kansas City, MO) perform remarkably well compared to other North American and European cities—in fact, they rank higher than every city in our data set except for the Asian cities. Because the Cost of Connectivity has traditionally been a consumer-focused report, our speed leaders and best deal for under $40 rankings are based on comparisons of the best actual plans advertised to customers in particular cities. In this section, we look at broader trends around the world and make comparisons between cities based on average expected prices rather than the actual packages offered by ISPs. The biggest challenge in comparing plans more broadly is that different packages are offered with different prices and different speeds. To address this we created a standardized metric using the best-fit regression line for each city to estimate the relationship between price and speed, allowing us to compare the estimated speed at a given price or the estimated price at a given speed. In Figures 7 and 8, we display estimates for a given city, which do not reflect any actual plans. 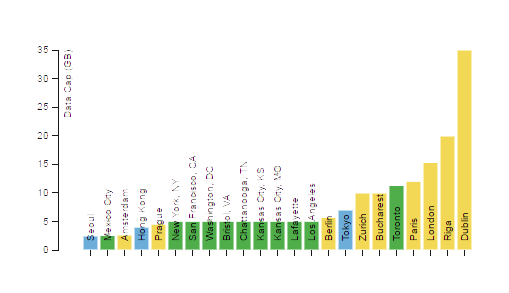 Figure 7 demonstrates the estimated speeds a customer could expect to get for $50 in each of the cities we surveyed. Hong Kong and Seoul are far ahead, with around 300 Mbps at $50, while Tokyo and Paris both hover around 200 Mbps. Most of the U.S. cities cluster between 25 and 45 Mbps, with only San Francisco, CA, and Chattanooga, TN, falling out of that range on the high and low end, respectively. Mexico City ranks last with an average of around 8 Mbps. Figure 8 demonstrates the estimated monthly price for 25 Mbps in each of the cities we surveyed. The results are largely consistent with our other observations, although in this analysis London comes out at the top of the list at around $24 a month, followed closely by Seoul, Bucharest, and Paris. The U.S. cities are still clustered in the bottom half of the pack, with the exceptions of Kansas City, KS and Kansas City, MO. Notably, Hong Kong drops much lower in this analysis, which reflects the fact that some providers offer speeds ranging from 8 to 100 Mbps at very similar or identical prices. This section focuses on the findings from our data on mobile broadband plans offered through USB dongles or mobile WiFi hotspots. The findings show that consumers in U.S. cities pay higher prices than many consumers in other countries in our data set for the services they receive. In certain cases, we find that international consumers can pay the same price as U.S. consumers for data caps that are as much as 40 times higher than those offered by U.S. providers. Figure 9 offers a comparison of the mobile plans that offer the highest data cap in each city for $40 or less. The most notable change from 2013 is the fact that no providers offer unlimited data plans for under $40, although some still offer high caps for affordable prices. For instance, customers in Dublin can pay around $27 for service with a 150 GB data cap. In the U.S., subscribing to Verizon’s 100 GB data cap, which is the largest data cap offered by a U.S. provider, would cost 27 times that amount ($730). Figure 10 presents a comparison of the cheapest mobile plan available in each city that comes with at least 3 GB of capped data, ranked by price. Copenhagen is once again47 the leader of the pack with a 7 GB plan at $7.63, while Tokyo’s NTT DoCoMo offered the most expensive plan at $40.55 for 7 GB. Figure 11 displays the average price of mobile broadband plans with data caps between 2 and 5 GB. 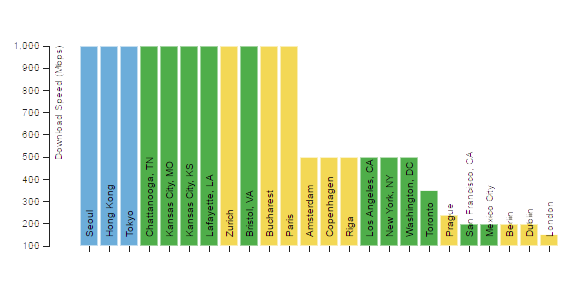 The U.S. cities in this figure all rank below the European cities. Notably, the Asian providers — with the exception of Hong Kong — also do not perform particularly well in comparison to Europe. In Seoul, lower-tier plans with data caps in the 2 to 5 GB range are priced worse than higher-tiered plans, where a customer can get 50 GB of data for nearly half the price. In Copenhagen, the average price for 2 to 5 GB of data is just over $10, while U.S. cities offer the same caps for four times that amount. Figure 12 displays the average data cap for mobile broadband plans priced in the $35 to $45 range. This chart and Figure 9 both show certain leaders in the mobile broadband space, most notably Dublin.48 The U.S. cities, which are all uniformly represented here because of the nationwide mobile market in the U.S., rank behind nearly all European cities in our data set. Riga offers mobile data caps that are four times as large as those of the U.S. cities, while Dublin outranks the U.S. by a factor of seven. Note: Copenhagen is an outlier offering an average data cap of 125 GB in this price range. We have therefore excluded Copenhagen from this chart to allow for easier comparison of the other plans. Since 2012 we have collected data on mobile broadband plans that use USB dongles and mobile WiFi hotspots. These services, while primarily intended for those who need broadband connectivity on their laptop while on the go, are sometimes used by people in rural areas as a replacement for high-speed wireline broadband.49 Over the past year, we noticed a small but not insignificant shift in the type of device offered with these kinds of plans: mobile WiFi hotspots are increasingly offered instead of USB dongles. USB dongles allow only one device at a time to connect to the Internet. Mobile WiFi hotspots allow for multiple devices to connect (usually around 10, depending on the model), meaning a subscriber traveling by train could connect her laptop, tablet, and smartphone at the same time. Or, in the case of a rural family, multiple computers, phones, and other devices could all connect at once. However, the data caps on these plans are often extremely restrictive, especially compared to traditional home broadband plans. Connecting multiple devices at once to mobile WiFi hotspots means that consumers may reach their restrictive caps even faster. These limits can make service very expensive for customers who attempt to use hotspots as a substitute for wireline service. For example, a plan from Verizon Wireless in the U.S. with a cap of 100 GB costs $730 per month. This is striking considering the average price for all 2014 U.S. wireline Internet plans in our data set is about $51/month, and most plans are either unlimited or are capped above 250 GB per month. While compiling the findings above, we noticed a number of other anecdotes that are worth mentioning. This section presents those additional findings, which show that, year-to-year, many ISPs have improved their speeds while also dropping prices. We also present findings that municipal broadband networks in the U.S. deliver considerable value to consumers while also providing some of the fastest speeds in the country. Additionally, we present findings on modem fees and data caps as well as some cases of ISP websites that were particularly user-friendly. As this is the third year of data collection for the Cost of Connectivity, we noticed some significant improvements and changes in service provision. This section describes some of those year-to-year changes in Toronto, Copenhagen, Paris, Dublin, Riga, Bucharest, and San Francisco, CA. In Toronto, several providers increased speeds while maintaining a similar price or lowering prices. Bell significantly increased the speed available for around $70. In Paris, SFR, a DSL and Fiber provider, improved the advertised speed of its DSL packages from 25 Mbps to 95 Mbps while maintaining a price around $18. Vodafone upgraded its services from DSL to Fiber in Dublin and the speed of its package priced around $45 improved by a factor of 12 (from 8 Mbps to 100 Mbps). In Riga, Baltcom subscribers pay just ten dollars more today than they did in 2012 for an improvement from 20 Mbps to 250 Mbps, a more than 12-fold increase. However, it should be noted that the provider charged less in 2013 for 250 Mbps. In Bucharest, the fiber provider RCS & RDS improved the speed of its offerings around $20 from 100 Mbps in 2012 and 2013 to 200 Mbps in 2014. In San Francisco, CA, Astound has improved the speed of its package around $75 by a factor of six from 18 Mbps download/2 Mbps upload to 110 Mbps download/10 Mbps upload. The largest ISPs in the U.S. have also made some improvements in the various cities that they serve. AT&T has nearly doubled the speeds of its 2012 offerings in Los Angeles, CA while prices remained relatively constant at about $64. Comcast bumped the 105 Mbps plan it offered in 2012 to a 150 Mbps plan while dropping its price nearly $100 in 2014. Time Warner Cable began upgrading its highest speed offerings in Los Angeles, CA, and New York, NY, to 300 Mbps for a price of $64.99 — an improvement by a factor of ten. Verizon’s FiOS service has not changed significantly in terms of price or speed, except for slightly improving its lowest speed tier in 2013 from 15 Mbps to 25 Mbps and maintaining the same price of $59.99 in some areas. Finally, it is also important to note that especially in the U.S., many of the improved plans are at the higher speed tiers, which generally are the most expensive plans available. The lower speed packages — which are often more affordable for the average consumer — have not seen as much of an improvement according to the data we have collected. All three cities offer gigabit speeds that place them on par with Hong Kong, Seoul, Tokyo, and Zürich in our speed leaders rankings, although the prices vary from city to city, and are ahead of the major incumbent ISPs in the U.S. In fact, the only other provider that offers gigabit speeds in the cities we surveyed is Google Fiber, which sells 1 Gbps service in Kansas City, KS, and Kansas City, MO, for the same price as EPB in Chattanooga, TN. By contrast, Verizon’s top tier is a 500 Mbps symmetrical connection that is available to some residents of New York, NY; Washington, DC; and Los Angeles, CA for about $300/month, which is significantly more than the cost of a gigabit in Chattanooga, TN (around $70/month) or Lafayette, LA (around $110/month) and comparable to the price of the gigabit package in Bristol, VA (around $320/month) but only half the speed. In general, our research shows that these locally-owned networks tend to deliver better value to their customers when compared on a price-per-megabit basis to competing cable and telecom providers in their own cities. Chattanooga, TN’s local network has been a world leader in broadband speeds for several years. In our 2013 report we found that the price of EPB’s highest speed tier had dropped substantially, from $349/month to roughly $70/month.53 EPB continues to offer its customers symmetrical gigabit speeds for just $69.99 a month. Its competitors, AT&T and Comcast, do not even come close to the municipal provider’s speeds and prices. AT&T’s fastest package provides customers with 45 Mbps for about $65/month and comes with a 250 GB data cap with overage fees for excess data consumption. Comcast offers a more substantial 105 Mbps download speed, but it costs roughly $95/month --- a nearly 50 percent increase in cost for approximately one-tenth as much bandwidth as EPB’s gigabit service. And EPB subscribers can get a comparable 100 Mbps package for almost $40/month less than Comcast’s 105 Mbps deal, with much higher upload speeds. Note: †Up to 250 GB of data. Overage fees are $10 / 50 GB. Lafayette, LA has also emerged as a leader in recent years as the local provider, LUS, has made consistent improvements to its offerings on a yearly basis. From 2013 to 2014 we observed a significant reduction in price for Lafayette, LA’s gigabit service: the cost dropped from around $1000/month to $110/month in a single year. Although LUS’s top tier is more expensive than the highest-priced packages available from AT&T and Cox, it also offers disproportionately higher speeds. Subscribers to LUS’s fastest offering get 1000 Mbps compared to 45 Mbps for AT&T’s service (priced at around $65/month) and 150 Mbps for Cox’s (priced at around $80/month). LUS also offers a much better value for entry level pricing — about $35 will get an LUS subscriber a symmetrical 20 Mbps connection, compared with 6 Mbps from AT&T and 5 Mbps from Cox for roughly the same price. The only other competitor that offers broadband service in Bristol, VA is Charter. Although the price comparison between Charter and BVU is not very striking,54 BVU does offer its customers far more choices, including the option to subscribe to gigabit service. Moreover, although the price of BVU’s gigabit package remained constant from 2013 to 2014, most of its other plans dropped in price. In 2014, BVU customers can get a 250 Mbps connection for what a 110 Mbps connection would have cost in 2013, or a 30 Mbps connection for the price of last year’s 20 Mbps package, and so on. Since 2012, Bristol, VA’s best-available package has quadrupled in speed while going up only modestly in price. In addition to collecting data related to the speed and price offerings, we recorded supplemental information regarding whether a plan has a data cap or a monthly modem rental fee.55 For plans where sufficient information was available,56 we found that only 65.8 percent of home broadband plans are not subject to a carrier-imposed data cap, although unlimited mobile data plans for USB modems or hotspot devices are increasingly rare. Users in the U.S. are more likely to face monthly modem rental fees as part of the standard offer for a broadband plan than users in other countries. The findings for home broadband plans that are subject to additional monthly modem rental fees demonstrate a difference between international and domestic markets. We found that American consumers are more likely than consumers in other countries to face additional modem rental fees as part of a standard broadband subscription. The majority of broadband plans we researched in Europe did not include a monthly modem fee. Some ISPs offer consumers the option to purchase a modem. This adds to the one-time costs at the time of activation, but the option to purchase instead of rent can provide consumers with savings in the longer term. In mobile broadband offerings, only a handful of plans for a USB modem or hotspot device in our data set offered unlimited data. Nearly all plans in the U.S. and around the world are subject to a data cap. This finding is consistent with our research from last year, and mirrors a larger trend among mobile providers to phase out unlimited data plans among smartphone subscriptions. Overage fees for data use beyond plan limits are becoming slightly more common. However, mobile ISPs in many European markets tend to throttle speeds to enforce data caps, rather than charge a fee. In American markets, on the other hand, most consumers are subject to overage fees, with only one carrier using throttling as a penalty. Over the last few years, ISPs have improved the presentation of their broadband plans. Largely gone are the days of navigating a labyrinth of pages and PDFs to find information ranging from activation fees to user agreements. In particular, our data collection process revealed a number of good practices in terms of plan flexibility and presentation, as well as disclosure, transparency, and broadband speed tests. Our data collection process showed that presenting plans side-by-side has become a more standard practice, although companies opt to portray pricing information in a number of differing ways and provide varying degrees of transparency and ability to customize plans. This year, two European providers stood out in the way they presented information to the customer. Balti-Com offers a simple, intuitive, and dynamic display that allows the customer to tailor plans to best fit the customer’s needs (Figure 25). This presentation provides the customer with the requisite information, including upload and download speeds, monthly price, and activation fees, all laid out side-by-side. In addition, the interface allows the user to toggle between month-by-month and 24 month contracts, and it updates the price in real time. 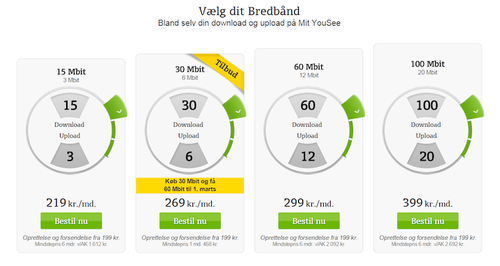 In Copenhagen, YouSee offers allocations of download and upload speeds between 18 and 120 Mbps. What distinguishes YouSee is that it allows the customer to decide how to allocate the bandwidth without changing the price. Within a given plan, customers can decide to allocate a higher or lower download or upload speed, allowing the customer to make the choice. 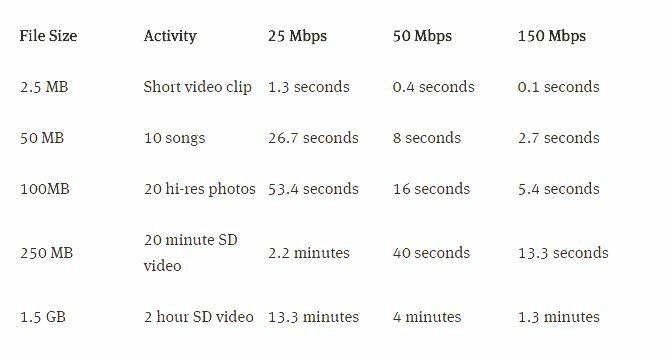 In Figure 26, the 18 Mbps plan on the left is set to a symmetrical allocation, though it could just as easily be set to 12 Mbps download and 6 Mbps upload or 15 Mbps download and 3 Mbps upload. This system works the same way for the rest of the plans YouSee offers. Several companies have taken steps to address these shortcomings. A number of providers list their operating information prominently on their website, which includes information on network outages as well as planned service interruptions, including the time of day and location updated in real time. In Seoul, SK Telecom lists its interconnection agreements on its website, a practice which increases transparency about the network. While providers are often required to list their network management practices somewhere on their website, some, like Astound in San Francisco, CA, link directly to their practices from each broadband package offered. Still other providers, like Bell in Toronto and EE in London, list the “rights of wireless consumers” or other similar documents that disclose the quality of service customers are entitled to and should expect from ISPs. This information is available directly on the ISPs’ websites in addition to being listed on regulators’ websites. Lastly, some providers offer a speed test directly on their website, improving transparency after service has been purchased or to help compare current speeds with new offerings. Practices like this and those listed above should be encouraged to increase transparency throughout the customer-provider relationship from start to finish. While the market for broadband has improved in parts of the U.S., Europe, and Asia, the data set from the 2014 Cost of Connectivity demonstrates through several types of analysis that customers in the U.S. still tend to pay more than their peers in Asia and Europe for comparable broadband Internet service. Our findings show that the average cost of plans in nearly every speed tier we selected57 is higher in the U.S. than in Europe, and seven of the nine U.S. cities surveyed for the report have average prices that are higher than the median for plans offered between 25 and 50 Mbps download speeds. We found similar results when comparing the average speed of plans ranging from $35 to $50, and the average data cap for mobile broadband plans ranging from $35 to $45. Finally, regression analysis of the data suggests that most U.S. cities lag behind European and Asian cities in our sample in terms of what consumers pay for 25 Mbps of service, and what consumers can get for $50. As in previous years, we continue to find that U.S. municipal broadband providers offer some of the fastest speeds available in the country at relatively affordable prices. While our report presents a number of findings, we invite others to use the data for further analysis. One of the goals of the Cost of Connectivity is to make the full data set available so that other researchers can explore it and perform additional analysis. Below are some of additional areas of research we have identified based on our observations and analysis. What is the relationship between fiber and speed? How does fiber affect prices of higher tier speeds, lower tier speeds, or speeds generally? *What is the relationship between broadband adoption and the prices and speeds available in a given location? Do higher broadband penetration rates lead to lower prices or faster speeds? Do fiber providers tend to improve their speed and price offerings at a faster pace than their cable or DSL counterparts? We have occasionally noticed that when a provider upgrades its highest speed offering, the initial price tends to be very high and is subsequently adjusted in the following year. For example, a provider in Lafayette, LA upgraded to a gigabit in 2013 for a monthly price of almost $1000, but dropped that price to $109 in 2014. Is this a common pattern, and is it influenced by any regional or technical factors? During our regression analysis, every city except San Francisco, CA suggested that as a customer pays more, she receives a higher speed. But in San Francisco, CA, we found the relationship between speed and price is negative, due to some very cheap, fast plans that break from the city’s pricing trend. *What characteristics of the San Francisco market make this possible? Are there other cities that are not included in our data set that display similar trends? The Cost of Connectivity records prices and speeds advertised on ISPs’ websites. Combining our pricing data set with other openly-accessible broadband speed measurement data would provide an additional level of insight and complementary data to the FCC’s Measuring Broadband America report. An up-to-date, thorough, transparent, and reproducible study of how tax structures and subsidies affect the price of broadband in various markets could bring great value to the discussion. This year, the entire data set, along with the data collected for previous iterations of the report will be available online in a single data portal at https://data.opentechinstitute.org/dataset/2014-cost-of-connectivity. We encourage all interested in this issue to peruse the data and seek answers to the questions asked above and more. 1. While we focused on Internet-only plans rather than “double-play” and “triple-play” plans, some providers do not offer standalone broadband plans. Our methodology explains this further. 2. Akamai’s State of the Internet Q1 2014 Report, Akamai, 2014, available at http://www.akamai.com/stateoftheinternet/. 3. 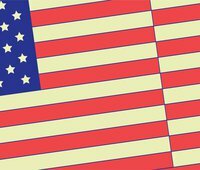 IPv4 and IPv6, American Registry for Internet Numbers, available at https://www.arin.net/knowledge/ipv4_ipv6.pdf. 4. The Intelligent Platform is a data collection platform which Akamai has deployed globally, consisting of a “distributed network of servers and intelligent software.” More information is available at http://www.akamai.com/html/technology/. 5. Such as the Measurement Lab platform: http://www.measurementlab.net/. 6. Phillippa Biggs, ed, The State of Broadband 2014: Broadband for All, International Telecommunication Union, September 2014, available at http://www.broadbandcommission.org/Documents/reports/bb-annualreport2014.pdf. 10. Ibid, 16. This definition originates both from the ITU and OECD, but the ITU has also defined broadband differently in other contexts. The ITU Standardization Sector has defined broadband as “1.5 or 2.0 Mbps.” International Telecommunication Union, “The Birth of Broadband - Frequently Asked Questions,” September 2003, (accessed October 22, 2014), available at https://www.itu.int/osg/spu/publications/birthofbroadband/faq.html. 11. Organisation for Economic Co-operation and Development, “OECD Broadband Portal,” July 22, 2014, (accessed October 22, 2014), available at http://www.oecd.org/sti/broadband/oecdbroadbandportal.htm. 13. Organisation for Economic Co-operation and Development, “Criteria for the OECD broadband price collections,” (accessed October, 22, 2014), available at http://www.oecd.org/sti/broadband/criteriafortheoecdbroadbandpricecollections.htm. 14. Tom Wheeler, “The Facts and Future of Broadband Competition,” public remarks, 1776 Headquarters, Washington, DC, September 4, 2014, at 3. Prepared remarks available at https://apps.fcc.gov/edocs_public/attachmatch/DOC-329161A1.pdf. FCC Chairman Tom Wheeler referred to 25 Mbps as a potential new threshold for broadband service, and a number of other countries have also proposed similar or higher thresholds in their National Broadband Plans: Angela Calvo, Universal Service Policies in the Context of National Broadband Plans, OECD Digital Economy Papers, No. 203, OECD Publishing, July 2012, at 20, available at http://dx.doi.org/10.1787/5k94gz19flq4-en. 15. 2014 Measuring Broadband America - Fixed Broadband Report: A Report on Consumer Fixed Broadband Performance in the U.S., Federal Communications Commission, June 2014, available at https://www.fcc.gov/reports/measuring-broadband-america-2014. The Measuring Broadband America program is a collaboration between the FCC, major U.S. ISPs, researchers, and the public interest community, of which OTI’s Measurement Lab project is a part. 16. More information about SamKnows is available at https://www.samknows.com/. 17. Roslyn Layton, The European Union’s Broadband Challenge, American Enterprise Institute for Public Policy Research, February 2014, available at http://www.aei.org/article/economics/innovation/internet/the-european-unions-broadband-challenge/. 20. As noted in the study (on page 6), Denmark’s VAT rate is 25%. In Germany, France, and the UK, the VAT rate is 19-20%—a small, but notable difference to consider when examining tax structures in the EU. VAT Rates Applied in the Member States of the European Union, European Commission, July 2014, at 3, available at http://ec.europa.eu/taxation_customs/resources/documents/taxation/vat/how_vat_works/rates/vat_rates_en.pdf. 21. Layton, The European Union’s Broadband Challenge, at 8-9. 22. Christopher S. Yoo, U.S. vs. European Broadband Deployment: What Do the Data Say?, University of Pennsylvania Law School & Center for Technology, Innovation and Competition, June 2014, available at https://www.law.upenn.edu/live/files/3352-us-vs-european-broadband-deployment. 24. The National Broadband Map data, which is used in the CTIC report, differs in that it provides potential speeds available in a given area rather than the actual speeds consumers regularly purchase and receive. 25. Martin H. Thelle and Bruno Basalisco, Europe Can Catch Up With the US: A Contrast of Two Contrary Broadband Models, Copenhagen Economics, June 2013, available at http://www.copenhageneconomics.com/Files/Filer/Publikationer/Europe%20can%20catch%20up%20with%20the%20US%20-%20A%20contrast%20of%20two%20contrary%20broadband%20models.pdf. 29. Everett Ehrlich, The State of U.S. broadband: Is it competitive? Are we falling behind?, Progressive Policy Institute, June 2014, available at http://www.progressivepolicy.org/wp-content/uploads/2014/06/2014.06-Ehrlich_The-State-US-Broadband_Is-it-competitive-are-we-falling-behind.pdf. 30. “The bill of particulars set forward by critics generally asserts that U.S. broadband consumers pay too much for too little and, either by assertion or inference, that Internet service providers are under investing and gouging consumers, amassing huge profits based on undue market power.” Ibid, 7. 33. Ibid, 7. The report relies on ITU broadband measurements, which are examined above and are shown to be a considerably lower metric by which to compare broadband. Note: this paragraph previously made comparisons based on GNI rather than GNI per capita, which is the metric used by the ITU and the PPI study to compare G-7 countries. This change, however, does not affect our ultimate conclusions. 34. As we explain in our methodology, we compare specific cities in an attempt to address population density challenges that often skew comparative assessments of broadband in the U.S. vs. other European and Asian countries. 35. Some Latvian providers list prices in Russian as well as in Latvian. 36. One Irish provider, Digiweb, offers fixed wireless service. More information is available at http://www.digiweb.ie/home/docs/metro_terms_conditions%20v11.pdf. 37. Analysis of Satellite-Based Telecommunications and Broadband Services, Vantage Point, November 2013, available at http://apps.fcc.gov/ecfs/document/view?id=7520956711. And satellite latency was found to have grown worse over the last year according to the FCC’s Measuring Broadband America report, see 2014 Measuring Broadband America, Federal Communications Commission. 38. Karl Bode, “New HughesNet ‘Gen4’ Satellite Failing to Deliver,” DSLReports.com, January 2, 2013, available at https://secure.dslreports.com/shownews/New-HughesNet-Gen-4-Satellite-Broadband-Failing-to-Deliver-122596; Doug Dawson, “The New Satellite Internet,” CCG Consulting, POTs and PANs blog, March 11, 2014, available at http://potsandpansbyccg.com/2014/03/11/the-new-satellite-internet/. 39. The World Bank, “PPP conversion factor, DSP (LCU per international $),” (accessed October 22, 2014) available at http://data.worldbank.org/indicator/PA.NUS.PPP. 40. Connecting America: The National Broadband Plan, Federal Communications Commission, March 2010, available at http://transition.fcc.gov/national-broadband-plan/national-broadband-plan.pdf. 41. Inquiry Concerning the Deployment of Advanced Telecommunications Capability to All Americans in a Reasonable and Timely Fashion, and Possible Steps to Accelerate Such Deployment Pursuant to Section 706 of the Telecommunications Act of 1996, as Amended by the Broadband Data Improvement Act, GN Docket No. 14-126, Federal Communications Commission, August 5, 2014, available at http://apps.fcc.gov/ecfs/comment/view?id=6018253090. 42. Tom Wheeler, “The Facts and Future of Broadband Competition,” public remarks. 43. Akamai’s State of the Internet Q4 2011 Report, Akamai, 2012, available at http://www.akamai.com/stateoftheinternet/. Information about the Q4 2011 report is available here: “Akamai Releases Fourth Quarter 2011 ‘State of the Internet’ Report” Akamai, April 30, 2012, (accessed October 22, 2014) available at http://www.akamai.com/html/about/press/releases/2012/press_043012.html. 44. 2014 Measuring Broadband America, Federal Communications Commission, at 52. 45. For more information on the speeds necessary for certain activities, see the sidebar above. For analysis of the changing needs of broadband consumers, see: Jon Brodkin, “Bandwidth explosion: As Internet use soars, can bottlenecks be averted?” Ars Technica, May 1, 2012, available at http://arstechnica.com/business/2012/05/bandwidth-explosion-as-internet-use-soars-can-bottlenecks-be-averted/. 46. What’s the Real Cost of Connectivity?, New America’s Open Technology Institute, February 2014, available at http://newamerica.net/sites/newamerica.net/files/policydocs/Whats_the_real_cost_of_connectivity.pdf. 47. Hibah Hussain, et al., The Cost of Connectivity 2013: Data Release, New America’s Open Technology Institute, October 2013, at 8, available at http://oti.newamerica.net/publications/policy/the_cost_of_connectivity_2013; Hibah Hussain, et al., The Cost of Connectivity 2012, New America’s Open Technology Institute, July 2012, available at http://oti.newamerica.net/publications/policy/the_cost_of_connectivity. 48. Dublin, while providing dramatically better service than most of the cities in this chart, still falls behind Copenhagen, which has been removed from this chart since it is such an outlier—---the provider “3” offers a 200 GB data cap for around $39. 49. Walter Glenn, “How Can I Get Decent Internet in a Rural Setting?” LifeHacker, September 16, 2013, available at http://lifehacker.com/how-can-i-get-decent-internet-in-a-rural-setting-1322518396. User comments in this article suggest that people in rural areas rely either on mobile broadband dongles or tethering their smartphone in order to provide home broadband access. 50. Leah S. Glaser, Electrifying the Rural American West: Stories of Power, People, and Place, University of Nebraska Press, 2009. 51. Benjamin Lennett, Patrick Lucey, Joanne Hovis, Andrew Afflerbach, The Art of the Possible: An Overview of Public Broadband Options, New America’s Open Technology Institute and CTC Technology & Energy, May 2014, available at http://oti.newamerica.net/publications/policy/the_art_of_the_possible_an_overview_of_public_broadband_options. 52. In the first Cost of Connectivity report, these three cities with municipally-owned networks were chosen because of their inclusion in this Institute for Local Self-Reliance report: Christopher Mitchell, Broadband At the Speed of Light: How Three Communities Built Next-Generation Networks, Institute for Local Self-Reliance and Benton Foundation, April 2012, available at http://www.ilsr.org/wp-content/uploads/2012/04/muni-bb-speed-light.pdf. 53. Hussain, et al., The Cost of Connectivity 2013: Data Release. 54. BVU charges about $50/month for 30 Mbps download and 5 Mbps upload, compared to Charter’s 30 Mbps download and 4 Mbps upload package for around $48. 55. We are not always able to find complete information for each plan, in many instances because ISPs’ websites can be unclear about what costs are included in a given service offering, with information often buried in various footnotes, subpages or terms of service. We discuss the challenges of this kind of data collection in greater detail in our previous report, Reining In The Cost of Connectivity, available at http://newamerica.net/publications/policy/reining_in_the_cost_of_connectivity. 56. It is important to note that for this field, there was no data available for more than 50 percent of the plans we surveyed. The percentage is based on the number of plans that affirmatively indicated whether there was a data cap or not. 57. Specifically plans in the 4-6 Mbps, 15-20 Mbps, 30 Mbps, 50 Mbps, and 100-150 Mbps download speed ranges.